"Divine Substance" is a mixed media digital transformative painting. In the creation process of this painting I was searching for soothing colors that would glow and flow together with magic. The essence of flowers are in the forms and the colors. Like the flower of a fuchsia plant, there are pinks that turn to magenta and to plum. The blues vary from turquoise to cerulean. Maybe it's just me but there is a fun whimsical quality and true beauty to this piece. 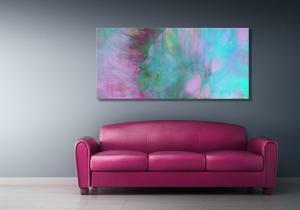 In this contemporary setting picture you can really get a sense how this artwork can change the feeling in a space. You can purchase this canvas art as large as 96″ x 44″. To purchase a print Click Here.